How to configure a Linksys RT31P2-AT Router/IAD to use PPPoE. Power This light should be solid green. It will light up when the router is powered on, and will flash as it is booting up, which will last for a brief time. If the power light continues to flash, this could indicate a problem with routerís firmware. Ethernet 1-3 Each corresponding light should display a solid green if there is a corresponding active device plugged into that port. It will flash when it is sending or receiving data. If no light is lit, this could indicate a problem with the device, router port or cable. Phone 1-2 The phone ports will flash when a connected phone is being used or an incoming call has been detected. When the phone is not in use the LED will be solid as long as the ATA is registered. If the LED is not lit, then the ATA has no current registered connection. Internet The Internet light will light green when it is connected to your ISPís modem and will flash as data is received or transmitted. The first step in configuring the Linksys router would be to connect the Ethernet cable directly from the computer to one of the three numbered Ethernet ports in the Linksys Router/IAD. Then power up the Linksys Router/IAD and then power up the computer. After the computer has opened to itís desktop, double click on Internet Explorer and let it completely open. It may display ìPage cannot be Displayedî, but that is all right. Type the following address into the address bar of Internet Explorer http://192.168.15.1 and click on go. A box requesting a user name and password prompt will appear. Leave the user name field blank (empty), and type in admin (lowercase) for the password. Then click on OK.
A Setup page should display in Internet Explorer. In the section labeled Internet Connection Type, select the PPPoE option from the drop down list. Once PPPoE is selected, enter your PPPoE DSL username and password provided by your Internet Service Provider into the routerís User Name and Password fields. Backspace over the password field making sure you start from the very beginning of the field and use the correct case. Your username format can vary from so you will need to know exactly how the complete username should be entered. If you are in doubt, your ISP should be able to verify the correct name, format and password. If the Keep Alive option is not selected, be sure to select it instead of the ëConnect on Demandí option. The ëKeep Aliveí option will ensure that your connection stays connected even when it is not in use. Scroll down to the bottom of the page and click on the Save Settings, or the Apply button depending on router model, to save your changes. You may be prompted that a reboot will be required. Click on OK and you should be returned to the previous page. Close and exit the web browser. Un-power all devices and your PC. Connect an Ethernet cable from the DSL modem to the Internet port of the Linksys Router/IAD. Keep the Ethernet cable from the computer connected directly to the Linksys Router/IAD. Power on the DSL modem, waiting until it has had an opportunity to resync with the DSL provider. Observe the indicator lights located on the modem and wait for the lights to stop blinking. A light indicating Power as well as DSL (or Internet, Online, Ready, etc.) should become solid to indicate that a connection to your Internet Service Provider has been established. Next you should power up the Linksys IAD/router waiting about 15 seconds before turning on your computer. The following steps can be taken to check that your connection to your Internet Service Provider is established. Log back into the Linksys router following the same procedure as above. Once on the Status page, you should see for a section labeled Login Status (or PPPoE Status depending on router model and firmware version). This will indicate the status of the connection. If the status repeats with Connecting, your Linksys Router/IAD is having problems connecting to your Internet Service provider. Repeat the Power Cycle and try again. Be sure to check for solid status and activity lights on the modem and the Internet light on the router. If this light does not turn on or does not display any activity, try using different network cables and then power cycle all devices to try again. If the status shows Disconnected, your Linksys Router/IAD was not able to establish a connection to your Internet Service provider. Repeat the Power Cycle and try again. Be sure to check for solid status and activity lights on the modem and the Internet light (or WAN lights) on the router. If these lights do not turn on or do not display any activity, try using different network cables, power cycle all devices to try again. 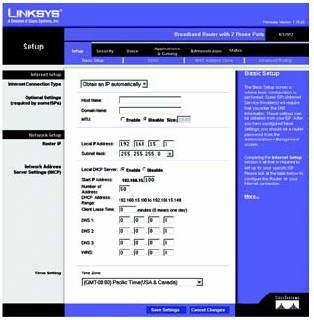 If the status is Connected, your Linksys Router successfully established a connection to your Internet Service provider and you should be able to connect to the Internet. Troubleshooting steps that can be taken if the connection fails. This indicates the PPPoE user name and password that you used are incorrect. Repeat the router configuration step and verify the spelling, case and/or format of your login user name and password are correct. Then, perform the ëPower Cycleí steps in Step 5 and try again. If the same message appears, contact your ISP and confirm your username and password. The router was unable to connect to your Internet Service Provider. Repeat the Power Cycle to try again. Be sure to check for solid status and activity lights on the modem and the Internet (or WAN) lights on the router. If these lights do not turn on or do not show activity, try using different network cables, power cycling all devices again. The router was unable to make a connection to your Internet Service Provider. Repeat the router configuration steps verifying the spelling and/or format of your login or use another user name and password. Then perform the power cycle again.